Google Brand Promotion - Google has introduced a new feature merged with Organic SERP results. The new feature I called as "Google Brand Promotion" which show's additional link's and says "BRANDS for .....based on user searched query". The new feature rolled out Today, which I noticed early morning. I had tested out for many keywords like USB Flash Drives, Printers, Camera, Laptop, Shoes etc Google has almost shown Brands Link for every googled keyword phrases. What exciting about Brand Links is, Google is showing them at Top just below the sponsored results. I was assuming that all this Google Brand's Links will open up Brand Website directly, but on clicking these Brand Link's it leads to the Google Results Page associated with searched query website/e-commerce store's having exclusive store front page for all these Brands or showing the page's which heavily include's keyword related to all this Brand's product. 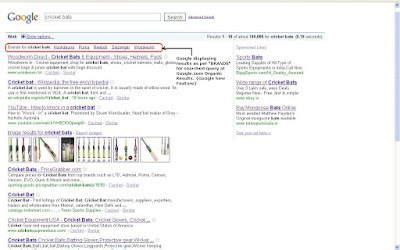 For Example: On clicking Kookaburra Brand Link, it open a new Google SERP page for "kookaburra cricket bats" with link to all such website's which sell's Kookaburra Bats. Conclusion: Get excited to explore one more feature included by Google. The main advantage which I see about Google showing Brand Links is all such E-commerce Store & Website Owner's needs to give more attention on choosing the right keywords with Brand name in coming days, do a detailed keyword research analysis. Also not to mention you need to have your website optimized more logically, more focussed on optimizing your website for all of your product/services offering Brand related keywords. Re-plan your SEO Strategy for getting ranked for BRAND's Keyword to see amazing results. So if you sell Cricket Balls and that too from Kookaburra, on top if your website is ready and optimized for Kookaburra related keyword, chances are much better for your website receiving huge traffic from Google. If you are looking for experienced SEO Expert who can help your website optimized by implementing latest and advanced SEO techniques, Contact me today to explore more on how I can help with driving positive traffic with better ROI from Google using organic SEO techniques. we posted about this as well. This is a big move by Google but it does not have to be bad for your biz. I never noticed such brand search results. I need to be more aware of this new change in strategy of Google. Thanks for giving valuable information.